I despair on the morning of our departure when we are cleared for takeoff. We are leaving Alaska and I have not seen Denali with my own eyes. Uncharacteristically, I am in a window seat, a consequence of the first class cabin arrangement. As I look out above the clouds, I am stunned. Now The Great One chooses to reveal itself: icy twin peaks rendered bright by the sun. “You see me now,” it whispers. We struggle upon our our return. Everything is different, off balance, needing more contrast. We are halfhearted in locating our bearings. We find it difficult to describe the pull of the land we have left. When asked, we are nearly mute: “Indescribable.” “Unbelievable.” “Awesome.” “Incredible.” The elemental presence we experienced courses through our veins, powerful, magnetic, unfettered, undeniable. We have been Outside for six weeks. Alaska holds us. Our compass has been reset to our own True North – the Last Frontier. I know exactly what you’re saying. I left Alaska over 20 years ago and it still has a hold on me. Thank goodness I’ve had the chance to visit it several times since then. It is an indescribable place, isn’t it? Thanks for visiting my blog! I am amazed to find that you have been posting about Alaska here! Did you see the photo that I put up too on one of my posts regarding attracting our travel dreams? My photo was taken some 8 years ago. I enjoyed the glaciers, the weather, food, everything! Hi Barbara – Thank you for knowing! We’ve felt so inadequate when trying to explain. Even this simple post was so difficult to get right, so I appreciate your reaction. Hi Evelyn – Yes, I was amazed and humbled to encounter your site at this moment, when I was trying so hard to get this post right. Thank you for stopping by. I believe what you describe is the reason so many of us stumble into the familiar when we wander. Hi Betsy – I take it you’ll be returning then? This post has made me want to go there even more now. It’s a small world – I saw Evelyn’s Alaska pic too, yet neither of us found your blog through the other. Isn’t that amazing? Some things were just meant to happen! I’ve only ever dreamed of going to Alaska. Wish I could make it there one day.. great description! Thank you, Andy. It was very meaningful, and so difficult to put into words. I’m so glad you appreciated it, and thank you for coming by. I’ve been drawn to Alaska ever since I read Dana Stabenow’s series of mysteries. 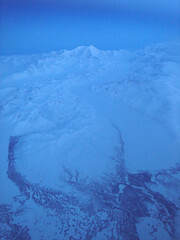 Now I visit a couple of blogs written by women who work in Alaska, just to look at the pictures. Other cold places attract me, too, for some reason — Antarctica and the Ice Hotel in Sweden. Not much chance of my ever getting to them, except in my dreams.